Butchers paper cartoon recording at the St Vincent de Paul Congress, St Aloysius College, Adelaide, 6-8 October. Keynote speakers Phil Glendenning (Director, Edmund Rice Centre) – ‘Daily Acts of Solidarity’, and Larissa Behrendt (Director of Research, Jumbunna Indigenous House of Learning, University of Technology Sydney) – ‘Sign of the times’, inspired the 180+ participants in “creating new solutions to ‘problem space’ opportunities”. Facilitators for the Congress were Future Friendly, Sydney Australia. Today’s Kneebone cartoon on the Pro Bono news website. Today’s Pro Bono News cartoon. Oxfam has released a report, An Economy for the 1%, showing that the gap between the world’s richest and poorest has widened in the last year. For an overview see Xavier Smerdon’s Pro Bono post ’62 People Make as Much Money as Half The World’. Oxfam Australia’s CEO Helen Szoke says ‘As a first priority, there must be an end to the dodgy tax practices and use of tax havens that allow corporations and individuals to accrue phenomenal wealth while others’ suffer’. 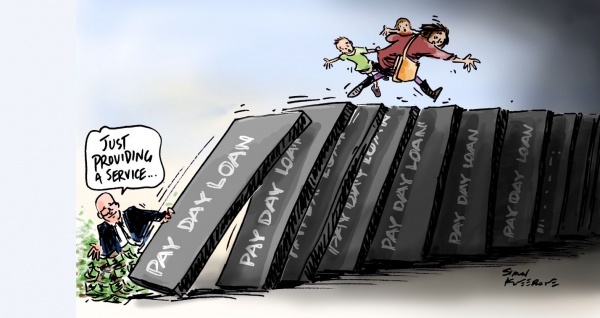 Today’s Pro Bono news cartoon following this week’s Four Corners (ABC TV) investigation into the payday loans industry. Read more on the Pro Bono website here.